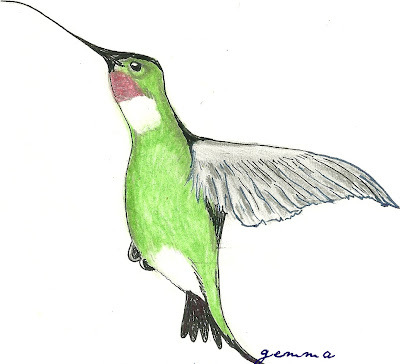 Several Hummingbirds live in our Olive trees. We keep our feeders full of sugar water. These thirsty little guys drain a feeder every other day. It is no wonder. The heat is on here now.Everything needs more water birds,plants,animals,children and us too. Beautiful hummer there. Sounds like my kind of diet. Love the birdie, of course! Gemma, what website do you work out of for your Dr. Oz Beach Diet? You drew a beauty Gemma! Thanks for the BEACH diet! drink lots of water !! Beautiful, I really like hummers. I will post about my experience with them soon.